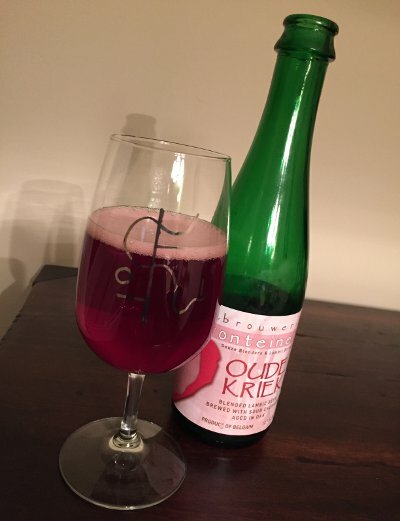 Along with the Oude Geuze, Drie Fonteinen's Oude Kriek is one of their flagship beers. It is basically youngish lambic aged on macerated cherries (pits included!) and refermented in the bottle. I'm reviewing one of the 2015 vintages, but the most intriguing vintage is the 2009. Drie Fonteinen has been around in some capacity for over a century, but most of that time they were basically a blender. They would buy inoculated wort from lambic producers, then age and blend it. 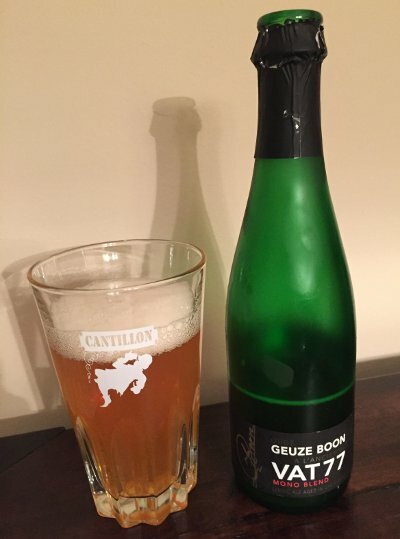 In 1999, they leased a brewing system and started producing their own lambic. 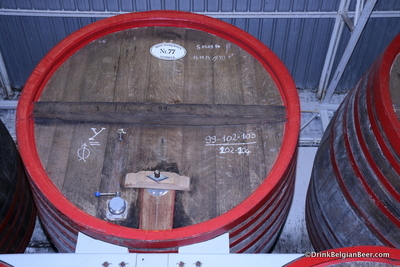 In doing so, they became the first new lambic producer in over 80 years. It was pretty good timing too. Lambic was thought to be near dead in the early 90s, but the winds were shifting, and apparently Drie Fonteinen had their finger on the pulse, because the 2000s saw a dramatic increase in interest in Lambic. This progress call came to a screeching halt one day when Armand Debelder entered his warehouse to find a catastrophic failure of his climate control system. In what's become known as the "Thermostat Incident", a hot air blower essentially never turned off, raising the temperature of the warehouse to 60°:C (14060°:F), essentially cooking over 80,000 bottles of lambic and even causing a few thousand to explode. Most of the lambic was ruined, and the 10 year lease of brewing equipment was coming due. Armand had to temporarily scrap his brewing operation and find ways to recoup. There were several strategies to do so, but the short story is that they're back to brewing again, and their future is bright. Beer Nerd Details: 6% ABV bottled (375 ml caged and corked). Drank out of a flute glass on 12/5/15. Bottled: 2015 January 18th. You got it, Jay! I'll start with some brief answers to his questionnaire, then move right in to the 5 year Anchor Christmas Vertical tasting I held last night. I love seasonal beers, but always try to keep some variety in the mix. Fortunately, the incredible breadth of beers available at all times allows for such exploration. What's your idea of the perfect holiday beer? That's a tough one, and I enjoy the variety of holiday beers we get. There's your typical winter warmer style, spiced (but not too strongly) and malt-centric, then you've got the make it stronger school of thought that seems to drive some Belgian examples, and then you get the people who just do whatever the hell they want. There's a place for all of these, I think, but what I associate with holiday beer tends to be the winter warmer style, spiced to perfection, with some hefty body to it. We're about to cover one in more detail (an Anchor Christmas vertical of some sort), but the other is drinking Samichlaus on Christmas Eve whilst wrapping presents. Given the strength of Samichlaus, it's a wonder the wrapping actually achieves its purpose of concealing the gift. As with Pumpkin beers showing up early, this is just something I can't get worked up about. That being said, it seems like much less of an issue for Holiday beers. I've sadly never been to one. I not really a huge fan of festivals in general, but a holiday beer festival sounds like it could be fun, given the right circumstances. 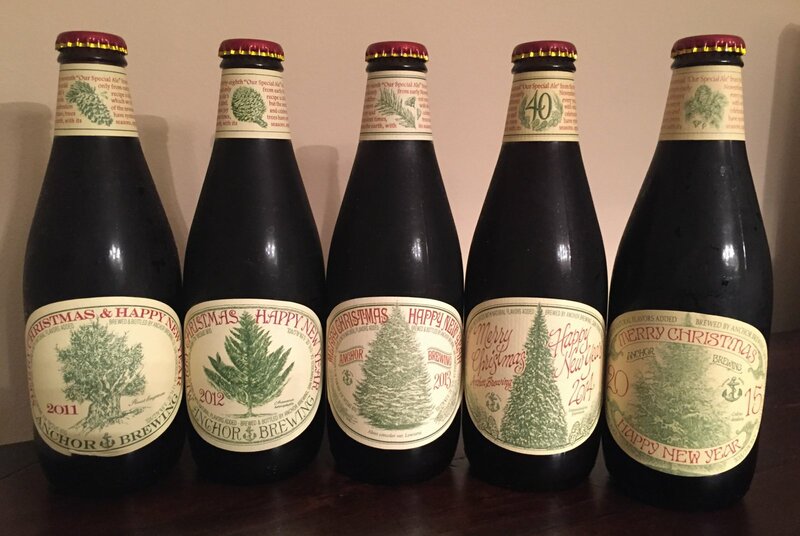 Alright, so we get to the main event, a vertical tasting of Anchor's annual holiday beer, Our Special Ale. Every year, I buy a six pack of the stuff, drink some, and reserve the rest for just this sort of occasion. In the past few years, I've been tasting two or three vintages side by side, and it's been fun seeing how they evolve from year to year. This is the first year I've managed to collect 5 different vintages, so I invited some folks over to do a little informal tasting and rating. This was not a blind tasting, and we proceeded serially from 2011 up to 2015, each taking 3-4 ounce samples. Due to the social nature of the gathering, I did not take copious notes, but we did all rank the beers and I managed to jot down a few quick thoughts on each vintage. I also took a look back through my previous ratings to see if any patterns emerged. 2012 - Fuller bodied and less spicy than the 2011, this one seems to have rebounded with age. For the past couple years, it's felt like this vintage was fading, but it held up well. 2013 - This one comes in somewhere between 2011 and 2012, and not in a good way. Spices muddled, clashing with malts. I liked this one when it was fresh, but it has faded considerably each year. 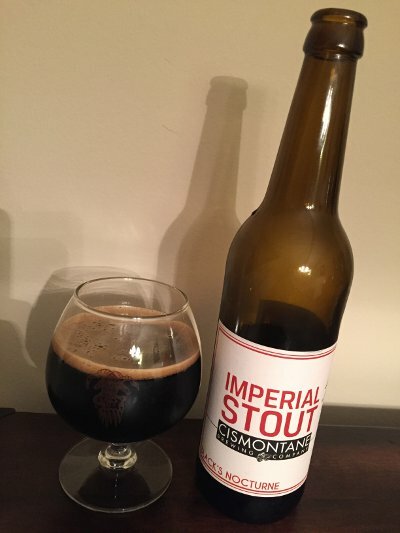 2014 - As I suspected last year, this one has held up very well, nice spice profile with a well balanced and strong malt backbone. This very well may be my favorite vintage of Anchor Christmas ever (though I've only really been doing this since 2010). 2015 - This most recent vintage is quite a departure, feels more stout-like than any previous vintage, with a roasty, smokey kick to the normal fruity, spicy character (this seems very faintly spiced, if at all). I predict this year's vintage will age fabulously. We only had 3 people rating the beer (I had planned on 5, but two flaked out at the last minute), yet some patterns emerged. 2013 was unanimously the worst of the vertical (average score 1 out of 5, standard deviation of 0! ), while 2014 was the clear winner of the night (average score of 4.67 out of 5). Two of us voted it as the best, and one voted it the second best. After a rough couple of years, 2012 rebounded into second place (average score 3.67 out of 5, though it did have the highest standard deviation), and 2011 and 2015 occupied the middle of the pack. For all you statistics nerds, you can check out the details on Google Sheets (I also included my ratings from the blog over time on the sheet). Finally, we poured all the remaining beer left into one glass. Cooooveeee! It smelled great, but by this point, there was no carbonation left. Also, there was only, like, an ounce or two of the blend. Still, this may be something worth trying more formally next year. Blending contest? I think that could be a lot of fun. Of course, my supplies of previous vintages are now dwindling. This was my last 2011, for instance. And I only have one 2012 left! 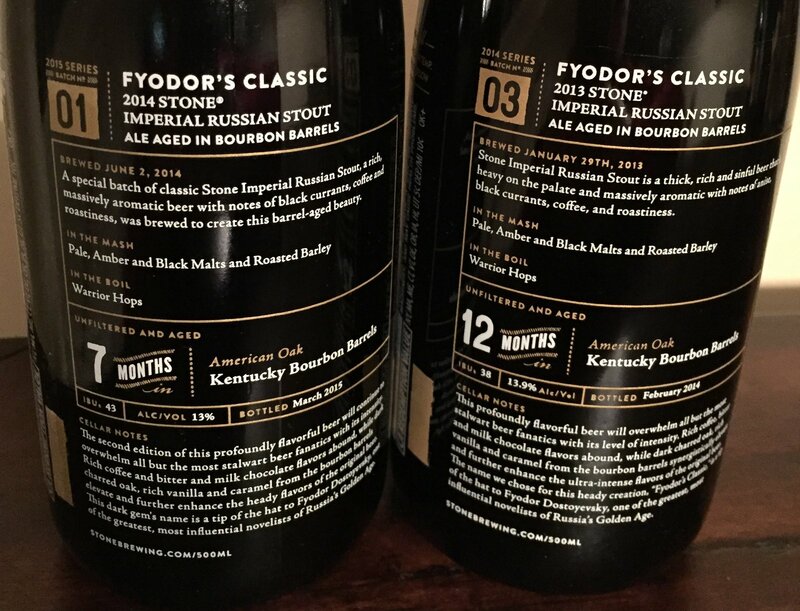 Then again, 4-5 years does seem to be the ceiling on aging these beers. Spices fade over time, and while these are hearty beers, they don't seem to take age as well as, say, a higher ABV, darker beer. It's still a lot of fun, though, and while it's generally what's in the bottle that counts, I enjoy the romantic notions of associating these beers with Christmas, and the unique label artwork just puts me in the mood of the season. Have a great holiday season everyone, and may it be filled with tasty beer! First - you are correct - the beers don't really age well past 3-4 years, so we recommend not laying them down much past that. Second - correct again - this year was a departure in that we felt less was more on the spice front, so we toned the spices down a bit as we upped the roasted malt to go darker & heavier... We agree that it will age nicely with this combo. Look for more of the same next year - maybe even a higher ABV & some more hops! We are actually selling vertical 6-packs of '12, '13 & '14 in our taproom store this year for the first time this year so that people can try them alongside our 2015 Special Ale for anyone who wants to try this at home. The notion of going further afield and maybe even playing with higher ABV and moar hops is tantalizing indeed! Very much looking forward to doing another vertical in 2016! This is basically identical to the previous batch. Minor differences include the fact that the Simcoe hops I procured for the bittering addition were slightly lower in alpha acids, but that only resulted in a dip of about 2 IBUs, which I judge to be fine. Indeed, the original goal with this brew was to produce something light and aromatic, not something punishingly bitter. Also, my turbinado sugar addition was slightly different this time due to the fact that I did not have as much in the pantry as I thought, so I had to compensate with a bottle of liquid sugar that I had laying around. I'm pretty sure I got that amount right, but my guess is that there's slightly less simple sugar added in this batch. Otherwise, the recipe is the same, and the key component is really the Conan yeast. As with the last batch, the target is an aromatic 8% ABV Double IPA with attenuation in the 75-80% range (maybe slightly less). 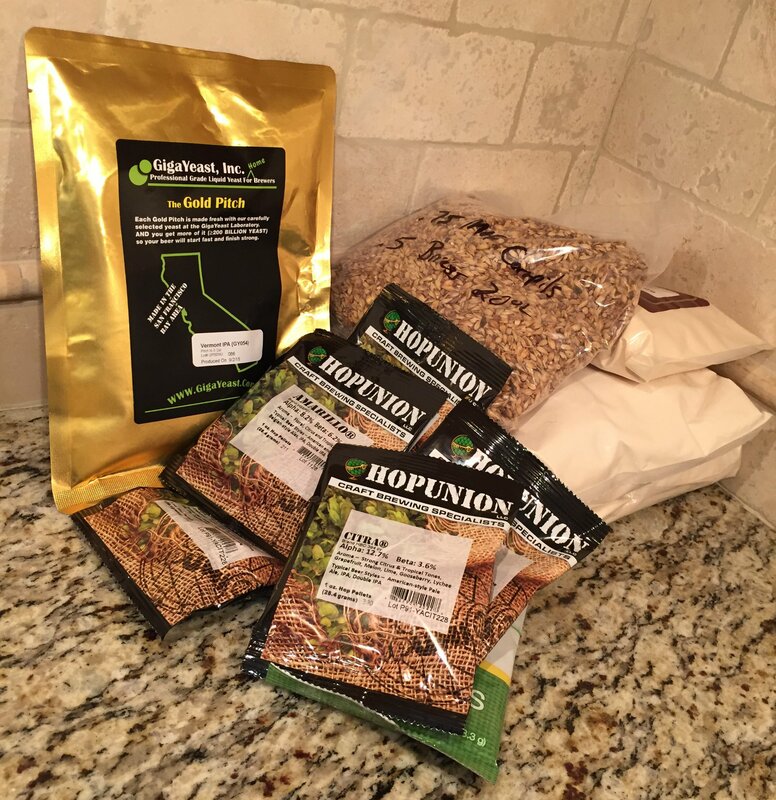 The specialty grains and wheat addition will provide a nice malt backbone and platform for the hops, while not being too bitter. IBUs are targeted for slightly less than 50, which is a little low for the BJCP guidelines, but I'm shooting for that newfangled juicy, bright, and citrusy IPA rather than the old school dank and bitter IPA. Original Gravity: 17.1 Bx, or 1.071, which is slightly lower than the target 1.074. This is not at all troubling since the last batch attenuated higher than expected and got us to something higher than 8%. This batch might hit closer to that target, assuming the yeast does its work. Once again, I have high hopes for this batch, though I am cautiously optimistic. The last batch turned out great, but I will admit the fermentation of this batch started slow. I brewed this on Saturday, and the airlock was essentially inactive until Monday. It's bubbling away now, which is heartening, but now that I think about it, I did have the yeast in the fridge for a while, and perhaps it was not as viable as the last batch. Fingers crossed! Dry hopping will commence after this weekend, and this sucker will be kegged by 12/13. It will be a nice Christmas present, I think. Next up? I'm not sure. I was thinking about making a small batch of wild ale (not sure what exactly I'll patter that after, but I'm looking at a full Brett/bacteria fermentation, rather than my previous mixed fermentation approach), but I've also been planning a Scotch Ale (which will, of course, be partially aged on bourbon soaked oak cubes). Only time will tell. Since both of those are time intensive, I might even get to brewing them sooner rather than later, even though they won't be ready for a few months (at which time, I'm sure the keg will be clear of Crom Approved!) At this point, I'm leaning towards Scotch Ale, because we're heading into winter, and that boozy, malty style is probably better suited for the season... We shall see. In the meantime, may Crom bless my current batch of beer. I'm sure the god of steel would appreciate such a brew! If I'm reading the whiskey nerd community right, it appears that Wild Turkey has fallen on hard times of late. This seems to primarily be due to lackluster special releases that nevertheless ran high on pricing. Even some of their standard offerings disappeared for a while, and I know many lamented the temporary loss of budget favorite 101 Rye (it is back, though I have never seen a bottle). At least one recent special release has garnered some praise, even if it seems on the pricey side. But as a part-time whiskey dork, I'm still working my way through the standard expressions out there, so all this talk of disappointing $250 bottles of bourbon don't really phase me. When I saw this private selection at State Line Liquors this summer, I took a flier on it. From what I hear, Wild Turkey does two things differently than most distilleries. First, they make a big deal about using the #4 barrel char level, also called "alligator" charring because the oak splits and looks a little like alligator skin, but near as I can tell, the grand majority of bourbon you'll ever see on a shelf uses #3 or #4. Second, they tend to put their juice in the barrel at a lower proof than most other bourbons. This seems to be a true difference, not just marketing fluff (as evidenced by the fact that they don't seem to trumpet this the way they do with the char level). I've also heard that master distiller Jimmy Russel (this bourbon is named after him, BTW) has tried to keep the process identical during his tenure, which is saying something since he's been at the job for 60+ years (his son Eddie is also helping). Single barrels are, by their very nature, inconsistent, but even then, I've seen mixed reports. Some seem to have gotten an exceptional barrel, most seem to get more middling efforts. How lucky will I be? Whiskey Nerd Details: 110 Proof, 55% ABV bottled (750 ml). Drank out of a glencairn glass. Personally Selected for State Line Liquors. Barrel: 2390. Rickhouse: H. Floor: 3. Hey look, I'm not the only beer dork drinking a Russel's Reserve retailer selection, and it appears DDB has a similar reaction (though, as always, he doesn't beat around the bush the way I do). Go figure. I've got some big guns coming in the Bourbon department though. Stay tuned for some Four Roses single barrels and, at some point, some Stagg (I am one of the few, the proud, the lottery winners in PA). And I've actually got a couple other bottles of interesting whiskey, so there's that too. About 4 years ago, I waited in line at my first beer release. I have since cycled through degenerate FOMO line-waiting and beer-hunting into a much more relaxed cadence. But it all started with Victory's Dark Intrigue in an event dubbed Dark Wednesday. Releasing something special on the day before Thanksgiving has become something of a tradition for Victory, though for reasons unknown, they never revisited Dark Intrigue (and claim they won't make it again). I loved that beer when fresh, and since I bought a case of the stuff, I've enjoyed checking it out over time. Other releases included Red Thunder and Earth & Flame. I love the local brewing scene, but I have also noticed a distinct lack of great bourbon barrel stouts. 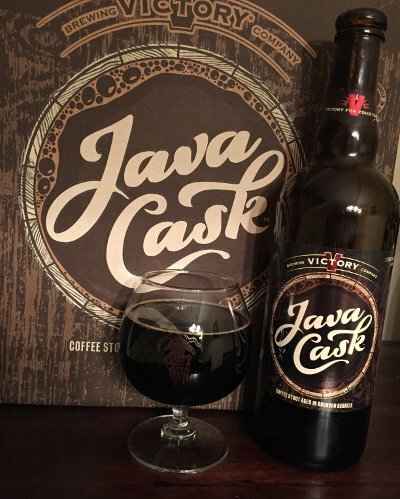 With Java Cask, we've now seen two new BBA Imperial Coffee Stouts in the past year alone (the other being Weyerbacher's Sunday Morning Stout). This is nice, but given my legendary aversion towards coffee, I wouldn't mind seeing some non-coffeed versions floating around every now and again. A man can dream. That being said, I feel like I'm gaining a better appreciation of great imperial coffee stouts, so let's get to the main event. Since I'm a glutton for punishment, I rooted around my cellar and found a bottle of Dark Intrigue to commemorate the occasion and compare both Dark Wednesday beers. Totally unfair comparison, but fun nonetheless. 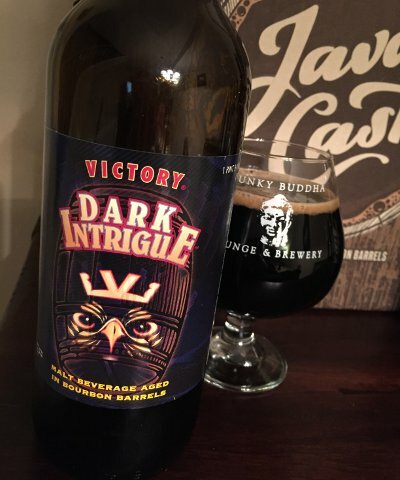 Victory Dark Intrigue 2011 - This is long past its prime, but it's still a worthy pour. Faded piney, resinous hops and oxidation are prominent, but the malt backbone and barrel aging keep things interesting. It felt much better integrated when fresh or within 1-2 years. It's fine now, just very, very different, and the bourbon barrel character has faded. If you have one of these tucked away, it's probably long past time to drink it, but it's still worth checking out. Chalk this one up in the "drink one fresh, save one to age" category... 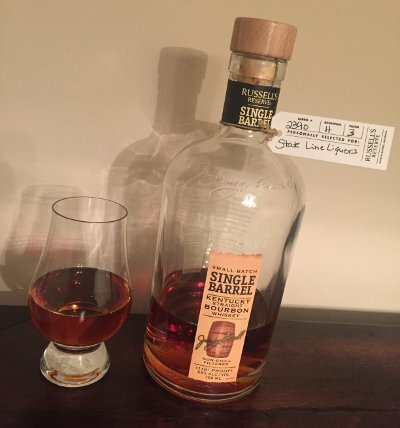 Difficult to rate this one, but if this was my first taste, it'd be somewhere in the low B range. Beer Nerd Details: 10% ABV bottled (750 ml caged and corked). 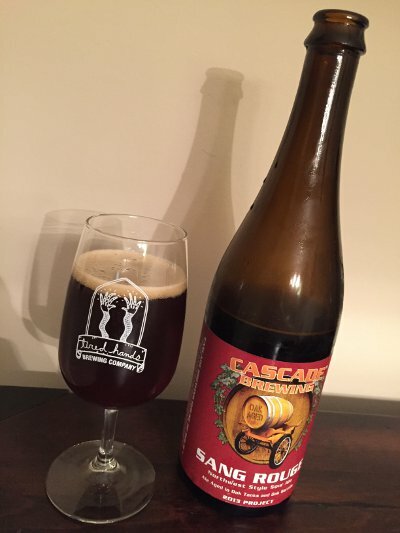 Drank out of a snifter on 11/25/15. Bottled: Nov 08 2011. Beer Nerd Details: 14.3% ABV bottled (750 ml caged and corked). Drank out of a snifter on 11/25/15. Enjoy by: 10 Nov 2016. It's been a while since I've reviewed a Victory beer, which is weird, since they are one of my most reviewed breweries. This was great, but man, I really want a non-coffee version of this. Fingers crossed that we'll see something like that in the future. I was going to put a bunch of effort into working a Le Cercle Rouge reference in here, but I figured the tenuous connection (zomg, they both use the French word for Red) and obscurity means I shouldn't bother. Any Jean-Pierre Melville fans in the house? No? Alright then, moving on. Beer Nerd Details: 8.4% ABV bottled (750 ml caged and corked). Drank out of a flute glass on 11/21/15. Vintage: 2013 Project (2015 Release). Wherein Allagash cuts out the middle man (you know, those greedy tables) and delivers a fresh fruit sour right to your face. All anthropomorphic jokes aside, I prefer to think of this as a subtle but scathing indictment of the three tier system of alcohol distribution put into place after Prohibition. Viva la fermentación! Well played, Allagash. Beer Nerd Details: 5.7% ABV bottled (375 ml caged and corked). 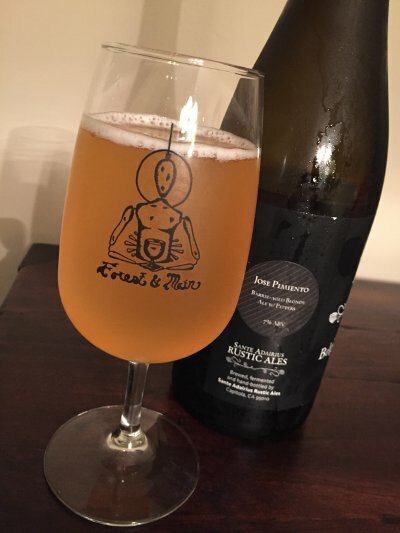 Drank out of a charente glass on 11/20/15. Bottled: July 16, 2015. The notion of beer "styles" is so ingrained in our current beer culture that it's hard to imagine coming to it fresh, the way Jackson was doing 40 or so years ago. It's faintly amazing that we ended up with something even remotely workable, especially considering the tremendous individualism of Belgian beer. Enter Sante Adairius' 16e series of one-off beers. It's a nod to Tim Clifford's time as a homebrewer, as he "gained a lot of notoriety" in competitions, especially with beers in BJCP Category 16e, a nubulous "catch-all" category of Belgian beer used to capture all those weird bat dropping and witch based ales and whatnot. Basically, it's Sante Adairius' line of experimental and weird beers that defy categorization. Beer Nerd Details: 7% ABV bottled (750 ml). Drank out of a flute glass on 11/13/15. Another winner from SARA! Many thanks to Jay from BeerSamizdat for sending it my way. Keep them coming, Jay, I need to get my hands on moar SARA! I'm continually fascinated by the subtleties of barrel aging. It's fun to try and reverse engineer what makes one beer great and another not as successful, though I'll be the first to admit that my SWAGs are just that. I am totally the worst, as has been amply demonstrated in this here blog. There are so many things that could impact the final product (i.e. 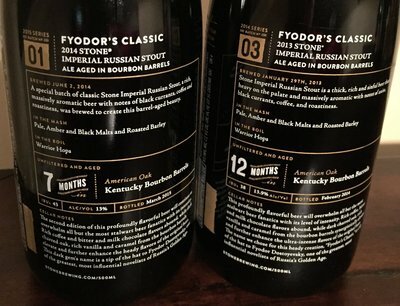 the base beer recipe, the barrel conditions, the brand of bourbon used, the time in the barrel, and so on) that it's hard to pinpoint causality. But it's still fun, because I'm the worst! So let's look at a couple of cases. Beer Nerd Details: 11% ABV bottled (500 ml). 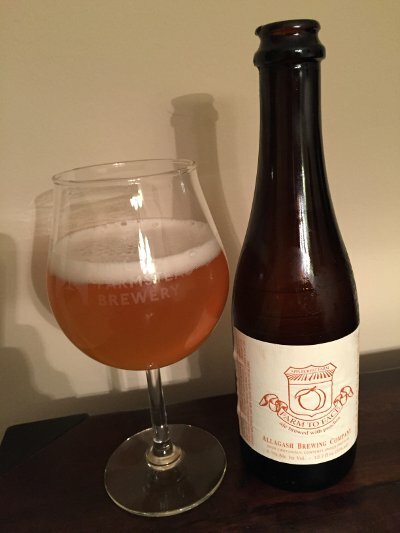 Drank out of a snifter on 11/13/15. Bottled 150902. I'd certainly try this again, but I'll be even more curious to try next year's vintage, if I can swing it. Beer Nerd Details: 8.5% ABV bottled (375 ml caged and corked). Drank out of a tumbler on 11/7/15. Brewed 10/26/11 and 10/27/11. Bottled 10/24/13. Best before 10/24/2033. Next up in the Mono Blend series is Vat 79, which is apparently the oldest cask they have, dating back to 1883. Would love to compare these two next to each other someday. In the meantime, Boon is one of the few Lambic producers who you can actually find, so go out there and snag some of those Marriage Parfaits, they're pretty good too.